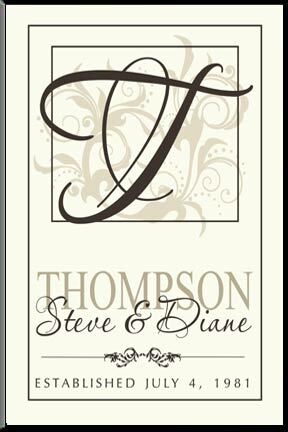 Personalized Vertical Ivory Scroll Initial Sign. Type the names and dates as needed into the text box below. The text format, sign layout, colors and fonts will be just as it is shown in the sample image. Your sign will look just like the one shown but with your names, date, and initial substituted in their appropriate locations.